In a countryside as rich as ours there is always going to be something to protect. Many of our rural areas support a whole wealth of wildlife perfectly suited to live there. We have incredible National Parks and Areas of Outstanding Natural Beauty (AONB) located up and down the country protecting natural history, iconic landscapes and specific habitats. At Sibton Park you are ideally located to discover one of these areas: the chalk landscape! Did you know that there are only 210 chalk streams left in the world, and of these 160 are located in England? The south and south east of England are perfect areas to find chalk streams; Dorset for example, Hampshire and Kent all have their fair share. So what's so special about the chalk stream? Due to its high alkaline content, and the filtering effect of the chalk, the waters of these streams are usually very clear. Often characterised as being wide and shallow, chalk streams tend to attract fly fishermen who fish for trout here. Fed from ground water that is forced up through a layer of porous chalk (called the aquifer), the water is packed full of minerals and emerges from the ground in springs, before flowing downwards towards the sea. They support an incredible amount of wildlife and are especially good for invertebrates and damselfly, the salmon species that feed off them, water vole, kingfisher and otters. Not to mention a whole load of vegetation. Quintessentially English, these streams have been a part of our history for years. Not only supporting wildlife but also people; shaping communities, being used to water crops, transport goods, power mills and provide fresh water. Why are the chalk streams in trouble, and what is being done? It is estimated by the World Wildlife Trust that only about 25% of our chalk streams are actually in good ecological health. This is due to a number of factors including pollution, climate change and over use. 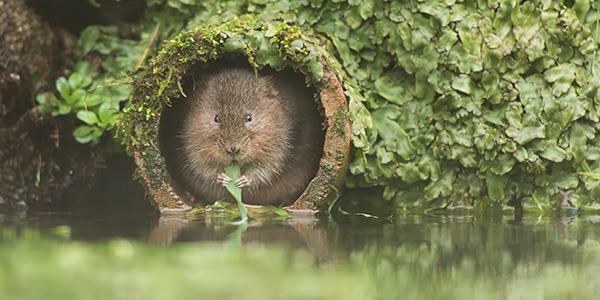 The Wildlife Trust are working in conjunction with the Environment Agency and Natural England, along with other organisations to raise awareness, restore damaged sections and decrease further impact to the chalk streams. 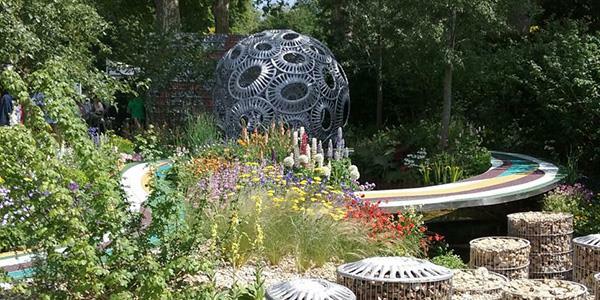 The 2016 Chelsea Flower Show featured a garden by Rosy Hardy that was influenced by the chalk stream and was designed to help visitors recognise the fragility of these precious habitats. The garden, which was called called 'Forever Freefolk' (pictured below), was designed in a way that leads visitors up from a dried up chalk stream bed, through luscious planting and towards the source. It highlights how easy it is for these habitats to suffer over time and is indicative of the changing landscape. One example of just such a stream, and the inspiration for Rosy's garden is the River Test which flows through Freefolk in Hampshire. In Kent the rivers Dour and Nailbourne are both chalk streams. The latter flows right through Sibton Park's nearby village of Lyminge. Elham Valley is a chalk valley that has been created by the river Nailbourne and is located in Kent's North Downs AONB. You can walk the Elham Valley Way from the coast at Hyth all the way inland to Canterbury. You will need to do it in sections as it is 23 miles long. It'll give you a wonderful cross-section of the countryside. If you want to tackle just one section of it why not try the walk from Peene to North Lyminge, or the walk from North Lyminge to North Elham? They are more manageable parts and will show you a beautiful section of the area. The whole Elham Valley Way route is waymarked and all the individual sections can be found on this walks guide. Find out how to stay at Sibton Park and discover Kent for yourself by entering your details at the bottom of the page.